I found this book in the library. It is slim, brightly coloured and gives practical advice on dealing with projectile vomiting and explosive diarrhea. As bedtime reading goes it ticked all the boxes. 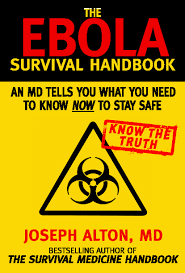 Published in 2014 at the height of the US Ebola scare, Joseph Alton MD provides some handy tips for surviving an Ebola outbreak. Naturally this advice can be adapted to handling a zombie outbreak in Australia. After all, everyone knows the zpoc will be caused by a virus. So if you can deal with the Ebola virus, the zombie virus will be a piece of cake. The book covers the usual stuff. How Ebola is transmitted and ways to you can prevent getting infected. But there were some interesting bits too. Supposedly there are only 14 hospital beds in the US capable of holding highly infectious patients. Turns out there is a black market in Africa for the blood of Ebola survivors, as injecting it into a patient is a way to treat the disease. And it was estimated that the hospital expenses for treating just one patient (Thomas Duncan) was over $500,000 US dollars. The cost of those face masks and latex gloves really add up. However if you are on a budget you can do it all at home with some plastic sheeting and buckets of bleach. This is what I found most fascinating, treating your loved ones at home while trying not to catch the disease yourself. Alton has some great tips, like using the plastic covers from your dry cleaning as emergency hospital gowns. The big message from it all is that looking after an Ebola patient is a lot of hard work and a lot of disinfecting. When you consider this in terms of a zombie apocalypse, no wonder anyone bitten tends to get whacked on the spot. It saves so much hassle in the long run.